Tag archive for "casey and ethan"
My birthday was last Saturday and we just put the wraps on one of the best birthday weekends I’ve ever had! It started out on Friday night with Eliot’s “Slipper Party” which was a slumber party that we threw for her to celebrate her big sister status. Somehow, “slumber” got translated into 4-year-old speak as “slipper” – it was actually a pretty cute and fitting name so we let it stick. We had multiple motives for throwing the party. The first was to thank all of the families who helped out so much with Eliot’s care while Casey was pregnant and I was going crazy trying to juggle everything. The second motive was to reward Eliot for being so easy-going with all of the schedule changes and uncertainty that each day brought her as we shuffled her from house to house in order to give Casey the rest she needed and me the time I needed to keep my head in the game. We figured a night off for all of the parents and a night of giggles, movies, cookies, and cream would just about do the trick!! 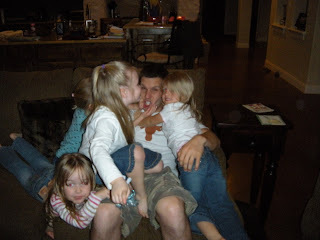 Eliot had five little girls come over for the evening with four of them staying the night. We got them off to a quick start with a pizza party followed up by freshly baked cookies, ice cream sundaes, and a movie on the big screen! After they were good and sugared up, I worked as much energy out of them with lots of wrestling on the couch, games of tag and hide-n-seek, and lots and lots and LOTS of giggles…it was GREAT FUN!!! 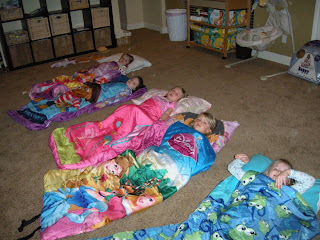 When it was time to settle down for the night, we put them all in sleeping bags in the gameroom and left them alone with Cinderella for the remainder of the evening. Believe it or not, the girls actually got some sleep, though probably not as much as they are used to on a normal night. In the morning, the girls got in a good round of cartoons, Lucky Charms, and playing house before their parents came to get their tired little angels. 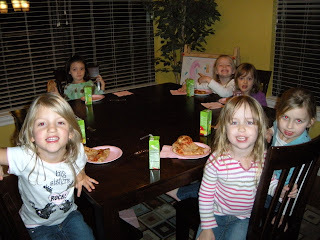 There was no rest for the weary Joneses, however, as we had to run out the door to get Eliot to a princess party thrown for one of her friends’ birthdays. She had a blast, of course, dressing up like a princess and playing with all of the other little girls! After a trip to the NICU and a little bit of rest time, Casey and I got to go out on our first real date in who knows how long. Casey’s mom and brother came to town (Uncle Kyle’s first visit to see the babies!) and they entertained Eliot for the night while Casey and I did some shopping and fine dining at The Domain in Austin. What a night we had! Good wine, good food, and good conversation about what was, what is, and what’s to come in this oh so boring life of ours!!! This was without a doubt one of my best birthday’s ever! 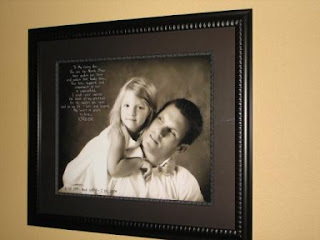 After seeing many pictures of our family throughout our home and website, people have asked how we became connected with the photographer. Last July Ethan gave me a gift that I will never forget! He scored major points with this one!!!!! One morning he left a note in my car that said “I know you are going to have a great day!” That afternoon he had a card delivered to me at work. The card said he had a change of clothes packed in my car and to meet him downtown at the Austin Museum of Art at 5:30. I was so excited about an unexpected date night!!!! It was also exciting because we had just found out we were pregnant so I thought it was so sweet of him to plan something special for us. So after meeting him downtown and walking through the museum he told me we had reservations at Jezebel’s, which is a restaurant that we both became big fans of after another surprise date night he planned for me in July ’07. During that dinner we exchanged gifts and he gave me a beautiful engraved bracelet that I wear everyday. So, after entering the restaurant they walked us back to the same table we sat at the year before. When we got to our table I looked up and there was the most beautiful portrait I had ever seen – it was of Ethan and Eliot. I was completely in shock and speechless!!! Ethan got a referral from a friend of a photographer, Tracey Taylor, and took Eliot to have their pictures taken together. He chose a 24×20 portrait, wrote me a beautiful message that was actually printed on the portrait, signed it and had it framed. I was first blown away that he came up with the idea and then that he was able to pull it off without Eliot telling me!!! It is a gift that will always hold a very, very, very special place in my heart! After some of the shock wore off he told me the second part of the gift was to go back to Tracey and have family pictures taken. I wasn’t so sure I wanted to because I had already gained some weight from he pregnancy and I knew after the new baby (didn’t know there were five yet) arrived I would want to do family pictures again. 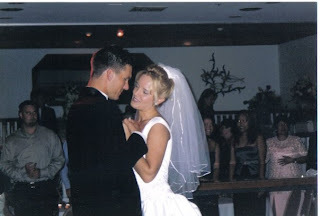 But Ethan and Tracey talked me into it by saying this would be the last time it would just be the three of us and we would want to remember this time in our lives. I am so thankful I finally listened because Tracey took some great shots of our family that I will cherish forever! After we found out we were expecting quintuplets, Tracey immediately said she wanted to help us document this miracle. So we have been going to Tracey’s studio in Pflugerville every three weeks to take pictures of my growing belly. It has been fun seeing how much I grow from session to session! Tracey has not only been generous with her time in taking these pictures (she has donated all of the sitting fees), but went above and beyond by offering a free 8×10 portrait to customers who bring in a package of diapers for us until the quints turn one! Check out her website and blog for more information http://www.taylormadephotos.com/. We are waiting to get the final word from “A Baby Story” on the Learning Channel (TLC) about doing a 1 hour television program on our pregnancy and birth of the quints! Below are a few questions and our answers we had to submit. 1) Tell us about your pregnancy. Did you have any difficulties conceiving? Have you had any complications or unusual circumstances with this pregnancy? We found out after trying to conceive our first child that we had a big challenge ahead of us. We were told that Ethan had severe male infertility. We met with a fertility specialist and were told there was a slight chance we could conceive a child together with in vitro. We knew that chances were slim, but felt it was something we had to try before exploring other options. After an unsuccessful try at in vitro we decided to select a sperm donor. It was a decision that a lot of men could have never made, but Ethan was unbelievable!!!! We knew the chances of us conceiving with an IUI were less than with in vitro, but I got pregnant the first try! We were so excited!!!!!! One of the possible side effects from the fertility drugs is the ovary growing so big that it actually twists (1% chance), and guess what happened to us! I was 6 weeks along in my pregnancy and was rushed to the ER in the middle of the night. The ovary had twisted 1 ½ times around itself. Dr. Kaylan Silverberg (fertility specialist) met us at the hospital and performed surgery to untwist the ovary. The pregnancy and the ovary survived! 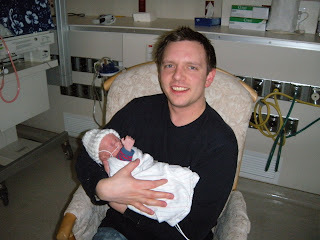 I went on to have a normal pregnancy and delivered Eliot at 36 weeks after only 4 ½ hours of labor. After 4 years we decided to try for another baby. Eliot has brought so much joy to our lives and we wanted to have the experience of pregnancy, raising another child, and giving Eliot a sibling to grow-up with. After finding out that the donor we used with Eliot was no longer available we chose another one and started the process again. We met with the fertility specialist and began the fertility drugs again. Going into the IUI the doctor said it looked like I could have 5 follicles that might release an egg. We weren’t really concerned because with our first pregnancy we had 4 large follicles and we conceived just 1 baby. I took a pregnancy test 2 weeks later and could not have been more excited that we got positive results on the first try again!!!!! I had blood drawn every week to check my HCG levels to make sure the pregnancy was progressing like it should. Each week the HCG levels were off the charts so we knew we had a good chance of being pregnant with twins or maybe even triplets! Our first sonogram was at 6 ½ weeks and we were shocked to find 6 sacks!!!! Dr. Silverberg detected 5 heartbeats and said the 6th one could just be progressing slower. At our next sonogram there were still only 5 heartbeats so we knew at this time that baby 6 had not progressed. Each weekly sonogram appt. has shown 5 healthy babies. The doctors explained to us the seriousness and risks involved to mother and babies with high order multiples, but reducing the number of babies was not an option for us. We stand strong in our faith and believe everything will workout the way it is supposed to. I will be going into surgery on September 30th for a cerclage to close my cervix. After the surgery I will be on bed rest for 2 weeks. Hopefully after the 2 weeks I will be able to go back to work for a month or so before bedrest again. 2. What has been the biggest surprise physically and/or emotionally of this pregnancy? 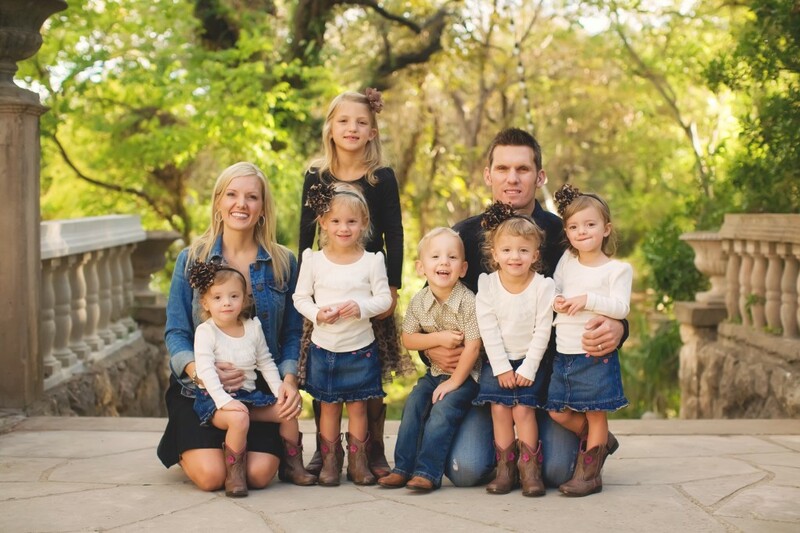 We never thought about having a large family, especially 5 at one time!!! It has been an emotional roller coaster ever since we got the news. Our daughter, Eliot is the most precious thing to us and we thought it would be great to give her a brother or sister. We never expected to give her 5!!!! The craziest thing so far with this pregnancy is how big I am getting so fast!!! 3. What sets you apart from the rest of the couples applying to be on the show? What would make you and your family members great guests and compelling to watch? Everyone’s story is unique, but we believe our story stands out because there are so many improbable events that are happening in our lives and that had to come together to make this happen. We grew up in the same town, met in the 7th grade, and started dating in high school. We dated all through college and got married six years later. Our life together was so normal and uneventful before we decided to have a baby so you can imagine our surprise when we found out about Ethan’s infertility. Less than 1% of men have this problem and the doctors have never been able to pinpoint a reason why he has this issue. It was a very difficult decision to use a donor, but the results have been amazing! Our daughter has been the center of our world since the day we found out I was pregnant! After Eliot was born, life seemed to return to being normal and uneventful, but once we decided to have another baby, things began to turn upside down all over again. Going into the process of getting pregnant again was just as scary as the first time because there are so many unknowns and the cost is so incredibly high. We had to give it a try because we really wanted Eliot to have a brother or sister. We both had a feeling that we would have multiples for some reason. There were lots of little “events” leading up to finding out about the quints that led us to believe multiples were in our future, but we never imagined we’d have more than two! The timing of this honestly couldn’t be more improbable. Ethan just started his own construction/remodeling company in May, his parents started the process of adopting two little girls in July, his brother’s family of 5 announced they were moving to England in August, Ethan began grad school in late August, and we found out we were having quints four days before grad school began!!! Whew!! Our heads are literally spinning with all of the changes coming in our lives, but we feel amazingly blessed to be where we are in life! We know the next six months will be the greatest challenge of our lives, but we are overwhelmed by the possibilities that this blessing will bring to our lives! There will never be a normal and uneventful day in our lives again!! !